This beautiful couple got married a few days before Christmas at Saint Sophia church the Greek Cathedral in Bayswater London. The reception held at Four Seasons Hotel at Park Lane in an extremely beautiful room amazingly decorated for this superb wedding. The day started with the bridal preparation at Michaela’s home in New Barnet, North London. We arrived early as we wanted to capture every moment of our beautiful bride’s preparation. Michaella chose to wear a unique delicate dress combined with statement jewelries that were handmade by her cousin. Her mother along with her koumbara (matron of of honour) helped her put the dress on; the moment was really emotional and it was a lovely time for us to photograph! Michaela’s result was chic and artistic. Lenya, Michaella’s wonderful mother, took care of every detail! With an extremely creative attitude and a sharp eye for detail she prepared everything from the bride’s boutique, home’s decoration for Stolisma, young bridesmaids outfits and so much more. Meanwhile at groom’s house, our second photographer was capturing Panayiotis’ preparation. Panny wore smart with a sharp and dynamic tuxedo and a bow tie, he looked so happy for the day ahead! He arrived at St Sophia in a DeLorean car, well known from the ‘Back to the Future’ film trilogy. We took the opportunity for some great shots that even Michael J. Fox would be jealous of. Michaella arrived at St Sophia in a classic Rolls Royce. Panayiotis was waiting her as tradition indicates! The orthodox ceremony officiated by the very reverend archimandrite Damianos Constantinou. The “koumparoi” exchanged the rings and the wedding crowns (stefana) three times and the priest gave his blessing to the couple. Family portraits followed the ceremony at St Sophia’s picturesque side garden. Just before the couple entered the reception room we had some time to take some great portraits of the couple at Four Seasons gorgeous surroundings. The reception was more than breathtaking! Four Seasons’ Oak Room and the Ballroom were red-lighted and elegantly decorated with fine-looking flowers giving a high-dose of romanticism and elegance to the place. They had chosen a fabulously theme for the tables and thanks to Peter Theoklitou from Theo Events everything looked, cared with love and good taste. Handmade Santa-Claus-boots pockets designed and sewed by Lenya as a gift for every guest. 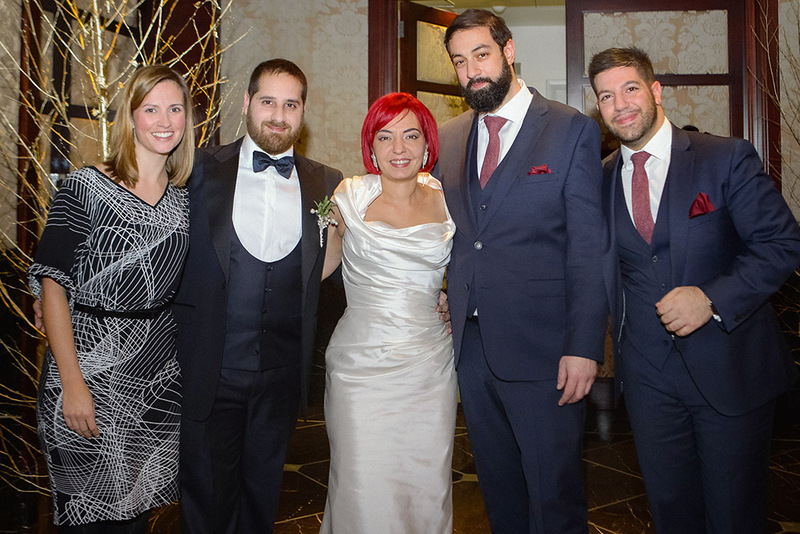 We would also like to thank Andreas Chrysanthou as well as Helen Martin for helping us create this wedding photo-gallery. The evening celebrations kicked off with music by Connexions, the popular Greek band with the talented musicians. We photographed the happy couple dancing the night away surrounded by friends and family. Celebrating a really wonderful day! It looked like an incredible day Michaella. You looked absolutely gorgeous. All those months of refusing my donuts certainly paid off. Many congratulations to you both and all the best fir the future.